You will notice that simpledream is coming at you in full blue now! The original site was supposed to be blue, but version 1.0 got changed to “shades of grey” at the last minute due to some time constraints for the launch date. It was actually weird how it happened. I read an article on “grey shadow” method for designing a website and thought is was so neat that I used it on the rough drafts for simpledream.net in Illustrator and Photoshop. Then the time crunch for launch came, and I said: “why not just launch it as it is?” The grey look was cool, and looked sharp with the logo and textmark. The grey look was never intended to last though, sad to say. Anyway, as of tonight the version 2.0 in blue is officially live. The biggest difference is the blue color palette, but you might also notice the top banner is changed as well to reflect the true simpledream logo. The only other things added were some graphical elements and icons to spice up the design. 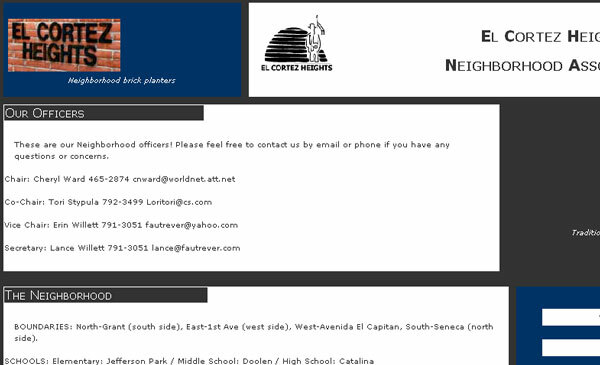 This week simpledream web studio launched another standards-based web project: El Cortez Heights Neighborhood Association website. The group, ECHNA for short, is located in Tucson, Arizona. If you can’t wait to see it, then just visit site! If you want to know the why and how of the redesign, keep reading. To allow for greater control over the background technology and to streamline content production for the community-based website. The website had outgrown the previous setup and was ready to for change. By making a few big changes to the hosting, file management, and domain name as well as several smaller, much-needed changes to the visual design. Move to new host, Dreamhost. ECHNA was very tired of the Geocities ads that cluttered up the sidebar and the source code. New domain name now: elcortezheights.org. Easier to remember and tell people. The move to WordPress for site management allows a lot more control over the production and behind-the-scenes programming now. This is a huge improvement for site maintenance, stat monitoring, error pages, etc. Some basic improvements to the site were made, including ease of use and navigation. We tried to leave the look and feel the same, but update the design to be more professional and engaging. Still very simple and easy to use, though, and not complicated for someone to get around and find interesting and useful content. Graphic elements were polished and updated. You can view the old site (which is still up) for comparison. Also, compare it with a view of the original design from 2002. Needless to say, ECHNA has come a long way.